If you are into volleyball, especially if you are playing professionally, you know that wearing the right volleyball shoe is just as important as your gameplay. Sports shoes get beaten up as much as you do or even more, so it is only fitting that you find one that is designed to keep up with your performance. 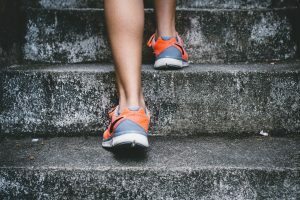 You want to find something that is going to provide stability, flexibility, support, and traction, all while still keeping you comfortable enough to do what you need to do on the court. Because of the specifications of the sport, you need something that is made specifically for volleyball—not basketball shoes, and certainly not badminton shoes. We have put together a guide to help you get the best volleyball shoes for you, a pair that will enhance your gameplay and let you play like the elite athlete that you are. Shoes that are made specifically for volleyball provide better traction. Since you are going to do a lot of side-to-side moves during the game, you need something that will prevent accidents on the slippery surface of an indoor volleyball court, thus avoiding injuries. Volleyball shoes, in particular, are made with thicker cushioning/gum rubber soles that enhance grip. 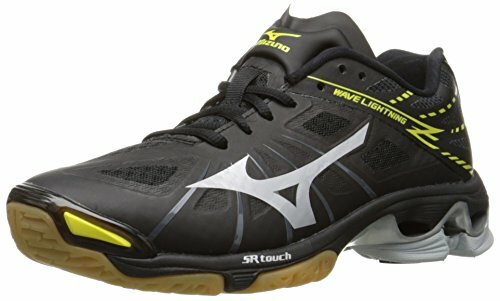 If you get badminton shoes instead, going with the idea that they are similar and do the same things, you will get a thinner sole since badminton players need a low center of gravity for swift movements. Volleyball shoes, in spite of being providing ample support, should not compromise comfort. They should be lightweight and soft on the inside. Your feet should be able to feel relaxed, yet kept firmly inside the shoes so as not to stifle movements. Volleyball shoes also give way for releasing perspiration from your feet, so you don’t feel sweaty inside. They are also generally more lightweight than most athletic shoes, so jumping and shifting of weight will not be a problem. Playing volleyball consists of a lot of jumping and landing, so the cushioning of appropriate volleyball shoes absorbs shock and reduces the impact on your knees and ankles, preventing any possible injury. The balls of the feet get the most of this shock, hence, the extra foam in the midsoles of volleyball shoes. There are different styles and designs available on the market for volleyball shoes, and there is a plethora of choices specifically for your role in the game. Whether you are the libero or the setter, there is one designed to aid you with the movements required by your job on the court. It goes without saying that the correct volleyball shoes should fit perfectly. As already mentioned above, you should be able to move around in your shoes, but your feet should not be able to move inside your shoes. The feet need to be kept firmly inside, yet still as comfortable as they can be. When shopping for volleyball shoes, try them on so you know what it feels like to jump and do lateral movements in them. When playing, you should not be bothered by other things that are unnecessary to the game, like loose or uncomfortable tight shoes. Look for volleyball shoes with an upper part made with synthetic mesh material or nylon, since these materials facilitate proper ventilation and breathability. You want your sweat to not be locked in inside and make you uncomfortable during your game. 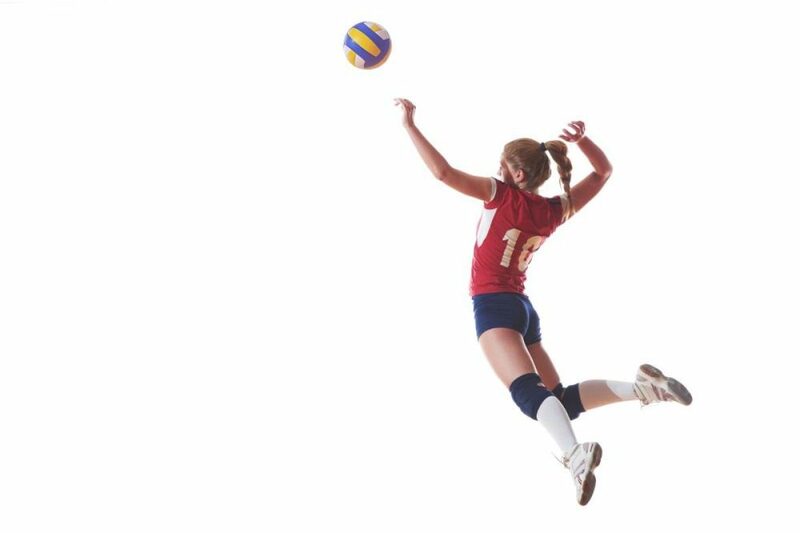 Volleyball requires a lot of jumping, landing, and shifts of weight, so you need something that is going to reduce the shock on your knees and ankles at the moment of impact. To be able to find out whether these shoes will give you this, simply take a look at the insole and the outsole. The insole of the shoe should be made with EVA (ethylene vinyl acetate), and the outsole should be made with materials such as rubber, polyurethane or thermoplastic polyurethane. These make the shoes damage resistant and you won’t be worrying about worn out volleyball shoes for a long time. 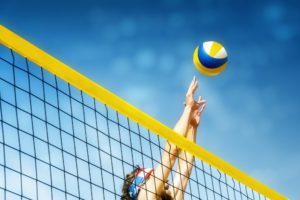 The surface of indoor volleyball courts can be quite slippery, plus you are required to do a bunch of risky moves that might cause unwanted accidents. Therefore, you want volleyball shoes with a gum rubber soles to help you out with the possibility of slipping and sliding during the game. These are very comfortable volleyball shoes. A testament to their claim of comfort is the fact that you don’t need a break-in period to be able to wear them without acquiring blisters and soreness; they don’t hurt and you can play in them right from the very first time you try them on. Another feature that contributes to their comfort is the weight. Because they are super lightweight, you can jump high, do lateral movements, and run around with them on and not feel like you are wearing athletic shoes. The rubber soles give you superior grip on any indoor surface, so slipping is not a possibility with this shoe. You can confidently play knowing that your volleyball shoe has your back. The Essence 12 comes in a simple, yet attractive design suitable for women of all ages. And even though they are white, you don’t have to worry about them getting dirty and having to clean them since it is very easy to do so; you only need a warm, damp cloth to gently rub on the surface and you’re good to go. While the Essence 12 volleyball shoes come with an impressive and reliable list of benefits, they are one of the less expensive options in their range of volleyball shoes. You have to keep in mind that these shoes may come in a slightly larger or smaller size than what you would expect. Some reviewers who have had to return their first purchases in exchange of a better fitting pair complain that they do not measure the same as other athletic shoes, and their usual sizes were not accurate. 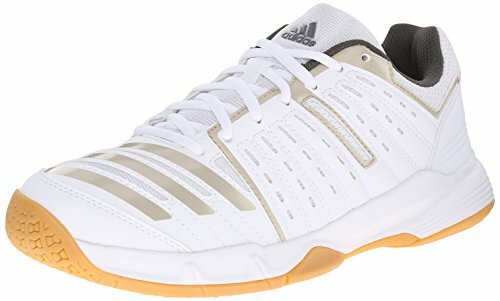 Overall, the Adidas Essence 12 are a good choice considering their price and performance. 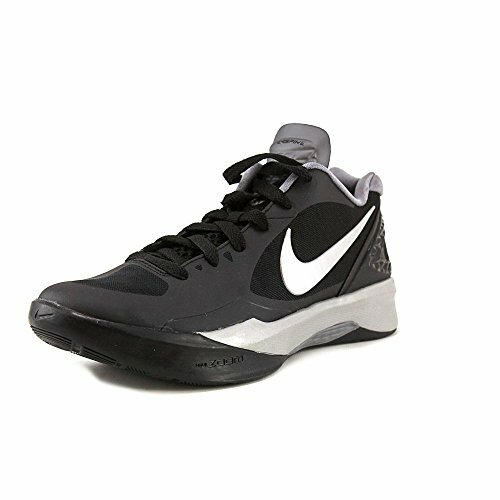 It provides stability, support, and comfort, all that you need on the court. The soles of these volleyball shoes allow for more adventurous movements on the court because of their superior cushioning which effectively reduces shock from impact during landing from a jump, maintaining comfort and reduces the possibility of injury. The arch support is also excellent since it can even be worn by someone with flat feet, as some users have testified to. Despite the outstanding support they provide, they are still lightweight, so it’s easy to change direction and do sudden jumps and stops. Even though it is not recommended to use volleyball shoes for other things outside of volleyball, customers have enjoyed wearing them to play other sports such as badminton and tennis, and even when working out at the gym because of how comfortable they are. Customers also commended the accurate sizing, making it easier to pick your size and purchase online, which, of course, is risky—but you can worry less with the Gel Rocket 7. These shoes come in a variety of colors that you can choose from, all nice and attractive, and appropriate for women of all ages. 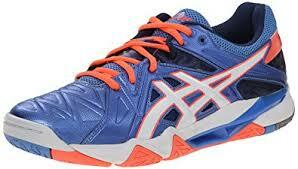 These are also one of the less expensive options among volleyball shoes on the market. These shoes may cause some pain and soreness during the first few uses, just like with any other shoes, but take note of this break-in period before purchasing and testing them out during a game; this is not advisable. Two customers have observed that these do not last very long, and started to fall apart after two weeks of continued use; for this reason, these might be good as backup shoes instead. Nevertheless, remember to take proper care of your sports shoes and as much as possible, do not wear them except for playing volleyball. These volleyball shoes fit snugly and keep your feet comfortable. They also follow standard sizing, so you are most likely going to pick your correct size right off the bat. Because of the top-quality cushion, they keep the foot relaxed while you are busy moving, jumping, and landing. Because of the wave construction, they facilitate even-shock distribution so you don’t experience shock solely on your knees and ankles, which would mean pain and worse, an injury. This makes it possible to do whatever you want and whatever you need to do on the court for they are sure to keep up with your swift movements. True to its claims, you can rely on the rubber for a firm grip on any indoor court surface so you don’t slip while in the midst of hitting that ball. These shoes are lightweight enough so there is no holding back when you need to push yourself off the floor. They keep up with your every move no matter what. The Wave Lightning Z comes in simple, yet attractive designs and comes in the colors black and silver. The unisex design makes it suitable even for men who need narrower volleyball shoes to fit. One thing to keep in mind is it takes quite a while for these shoes to break in. Because of this, you may get blisters on your feet during the first few uses. At least one user complained of distinct corners on the heels of the shoes that may snag on the opposite heel and may possibly hurt you. These shoe are quite narrow, so they are a good buy for people with narrower feet, both men and women. These cost a little bit more than other volleyball shoes on the market that perform just as well. 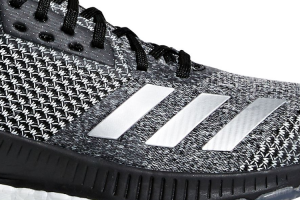 But overall, these are a good choice for those who can’t find volleyball shoes that are narrow enough for them, and they are durable enough to last you quite a long time. They would be an awesome investment. These shoes are extremely comfortable. They are sturdy and firm, and provide excellent support, yet make you feel like you are wearing nothing. You can wear these volleyball shoes for long hours of playing and you won’t experience discomfort because of the way they are designed. The low-cut ankle allows for free movement. To add to that, these shoes are also extremely lightweight, making for easy and convenient movement which, as we said, is important in playing volleyball. 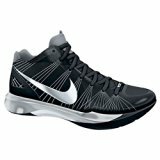 The Nike Volley Zoom is made of synthetic material which is essential for ventilation. The sole provides good traction—no worrying about slipping on the court. You can confidently shift from one foot to another without the fear of having an accident. These shoes come in a wide variety of colors that will match whatever your type or aesthetic. They also have a unisex design, making them suitable for both women and men who need narrower volleyball shoes. Since these shoes run narrow, people with wider feet might want to look into other shoes that will provide a better fit. These are relatively more expensive than most sports shoes, but they make up with their great quality. Overall, a good investment. These shoes are very comfortable and can keep up with your every move. Because of their light weight, you hardly feel anything while wearing them. Even after twelve hours of wear during a full day of sports activities and tournaments, you won’t feel any discomfort and soreness. The rubber sole of these shoes makes for enhanced traction on all indoor surfaces, which makes it possible for rapid movements. The Wave Lightning RX3 comes in a relatively affordable price compared with other shoes in its range. Because these shoes run a little smaller than standard sizing, you may want to go up a size to prevent discomfort and tightness. At least one user has complained of this online. Keep in mind that there is a break-in period with these shoes, which usually takes a few days. We recommend practicing with them first before playing in it in a major volleyball game. One customer felt that the padding did not offer enough cushioning and caused pain after hours of wear. Against this, there were a number of customers that felt otherwise. 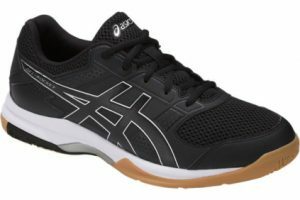 Overall, these are good volleyball shoes if you are on a budget.